Download "1 RÉSUMÉ WRITING AND COVER LETTER GUIDELINES Presented by The Career Center, University of Baltimore"
2 combination format is useful for those who are changing careers, entering or re-entering the job market, or for those with many diverse experiences. (See Appendix B for example.) 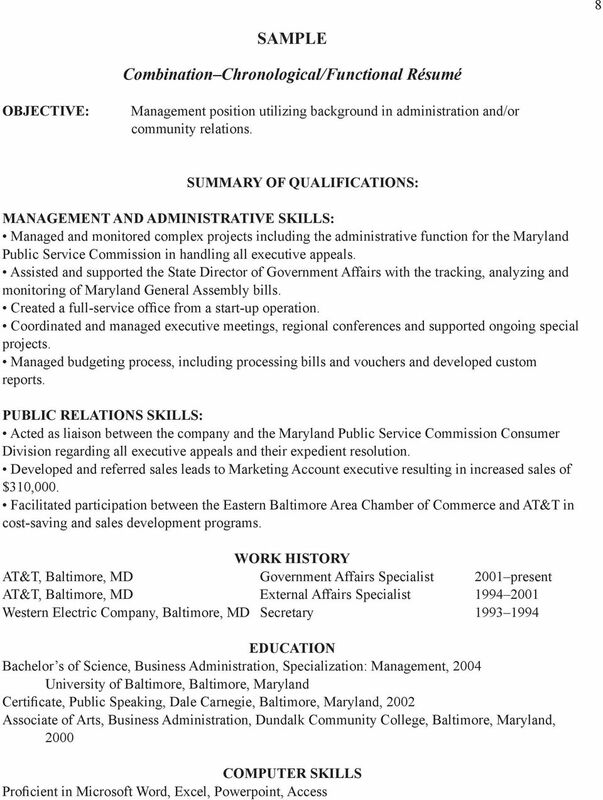 2 RÉSUMÉ SECTIONS 1. Identifying Information This includes your name, address and telephone number. Your name and page number should appear at the top of any additional pages. You may also want to include your address or personal homepage address in this section. 2. Objective There is much debate about including an objective on your résumé. The objective is a theme statement one that sets the tone for the rest of your résumé. An objective statement on the résumé is recommended for those who are clear about their career direction. On the other hand, a specific objective may limit the usefulness of your résumé. If you are unclear about your career goal or are hoping to use your résumé for several types of positions, it is better to state your objective in the cover letter. 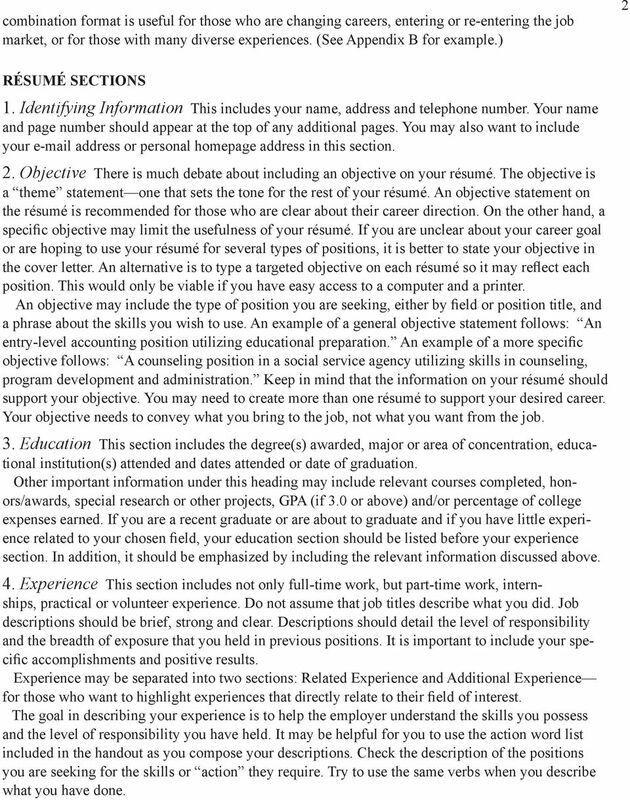 An alternative is to type a targeted objective on each résumé so it may reflect each position. This would only be viable if you have easy access to a computer and a printer. An objective may include the type of position you are seeking, either by field or position title, and a phrase about the skills you wish to use. 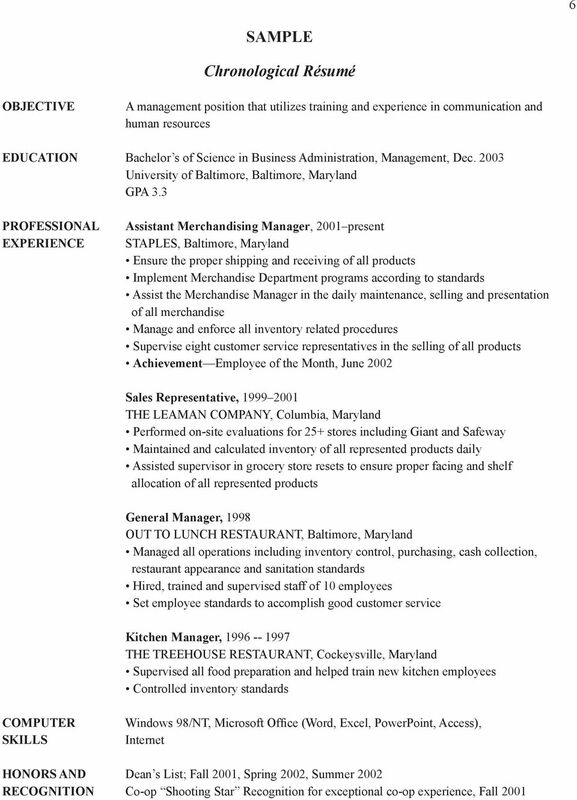 An example of a general objective statement follows: An entry-level accounting position utilizing educational preparation. An example of a more specific objective follows: A counseling position in a social service agency utilizing skills in counseling, program development and administration. Keep in mind that the information on your résumé should support your objective. You may need to create more than one résumé to support your desired career. Your objective needs to convey what you bring to the job, not what you want from the job. 3. Education This section includes the degree(s) awarded, major or area of concentration, educational institution(s) attended and dates attended or date of graduation. Other important information under this heading may include relevant courses completed, honors/awards, special research or other projects, GPA (if 3.0 or above) and/or percentage of college expenses earned. If you are a recent graduate or are about to graduate and if you have little experience related to your chosen field, your education section should be listed before your experience section. In addition, it should be emphasized by including the relevant information discussed above. 4. Experience This section includes not only full-time work, but part-time work, internships, practical or volunteer experience. Do not assume that job titles describe what you did. Job descriptions should be brief, strong and clear. Descriptions should detail the level of responsibility and the breadth of exposure that you held in previous positions. It is important to include your specific accomplishments and positive results. Experience may be separated into two sections: Related Experience and Additional Experience for those who want to highlight experiences that directly relate to their field of interest. The goal in describing your experience is to help the employer understand the skills you possess and the level of responsibility you have held. It may be helpful for you to use the action word list included in the handout as you compose your descriptions. Check the description of the positions you are seeking for the skills or action they require. Try to use the same verbs when you describe what you have done. 3 3 The following may help you compose your descriptions: Action Objective Outcome Final Contribution Verb Adverb Noun Adjective For what purpose to suggest how to qualify / quantify Example: Planned Campaign Promotional Fundraising 20% increase Written form: Planned promotional fundraising campaign which resulted in a 20% increase in contributions. 5. Special Categories Publications, research, awards, special certifications, professional memberships, language proficiencies (both foreign and computer), special skills, extra-curricular and civic activities may enhance your résumé if they serve to distinguish you or to support your career objective. Try to avoid categories that have only one item. Should you have only one item it may be more appropriate to include it under your education section rather than creating a separate heading for it. 6. References The phrase Available Upon Request will suffice. Never include the names of your references on your résumé. However, you should prepare a typed list of your references including name, position, title, company name, company address and telephone. Take this information with you to the interview but do not offer it to the employer unless it is requested. If space is limited, this section can be eliminated from your résumé. As you begin your job search you should contact three to four people who know you well enough to speak positively about your abilities and who will agree to act as a reference for you. You may assist them by discussing your job objective with them and giving them a copy of your résumé. You should concentrate on professional references as opposed to personal references. Faculty members, employment supervisors, advisors, etc., all make good choices for references. PREPARING TO WRITE A RESUME Vagueness is the greatest weakness found in most résumés. You must have a clear understanding of the position(s) you are seeking and the skills that you have to support the position. The first step in writing a résumé is to write an expansive rough draft of your background using the possible résumé topics as a guideline. Do not worry about the length of your rough draft. When you have in front of you all possible information from your background, it will be easier to construct logical groupings and to select the most pertinent information. To identify the items that should be included in your résumé, tentatively define the type of position you want and the type of organization where you would like to work. Select background information that supports the objective. After you edit and organize your draft, have others read and review it. MECHANICAL POINTS TO CONSIDER The reader s first impression of you is the appearance of your résumé. It should be attractive, easy to read, well organized and professional. Pay attention to underlining, capitalization, paragraphing, etc. Provide adequate margins and use the white space judiciously. Use such aids as capital letters, bold print, italics and spacing to help you emphasize what is important. 4 4 The phrasing of your résumé is critical to the effective representation of your background. Use specific, concise phrases and action verbs. Avoid abbreviations. Use a computer with a laser-quality printer and heavy bond paper to create your final draft. A more costly method would be to have a printer typeset your copy. Then take your résumé to a printer to be reproduced on a quality copier. Several forms of reproduction are possible and acceptable including photocopying and off-set. Paper types and shades should be conservative bonded white or ivory. Do not make copies of your résumé on a copier. The presentation of your résumé on quality paper is almost as important as the content of the résumé. 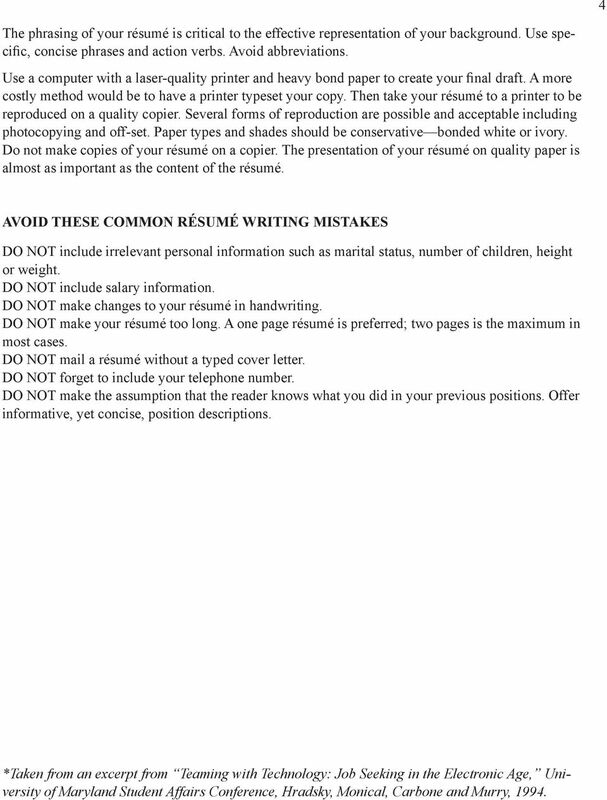 AVOID THESE COMMON RÉSUMÉ WRITING MISTAKES DO NOT include irrelevant personal information such as marital status, number of children, height or weight. DO NOT include salary information. DO NOT make changes to your résumé in handwriting. DO NOT make your résumé too long. A one page résumé is preferred; two pages is the maximum in most cases. DO NOT mail a résumé without a typed cover letter. DO NOT forget to include your telephone number. DO NOT make the assumption that the reader knows what you did in your previous positions. Offer informative, yet concise, position descriptions. *Taken from an excerpt from Teaming with Technology: Job Seeking in the Electronic Age, University of Maryland Student Affairs Conference, Hradsky, Monical, Carbone and Murry, 1994. 5 5 Appendix A Chronological Résumé Format NAME Street Address City, State Zip (Area Code) Daytime Telephone Number Address (if you use it regularly) OBJECTIVE: (1) Type of position; (2) Special Skills or Interest Areas EDUCATION: (List this information from most recent to least recent.) Degree - Area of concentration -Institution Name - City, State - Date *May include upper level courses completed in area of concentration *May include GPA, if over 3.0 *May include academic honors/awards if you have several list these in separate categories EXPERIENCE: Position Title - Company Name - City, State - Date Description of duties and responsibilities (position title alone does not tell employer what you have done, what skills you have) *Describe your responsibilities using ACTION VERBS stress results and accomplishments. ACTION VERBS demonstrate skills, i.e., Organized, Developed, Wrote, Prepared, Designed, Implemented. * Include volunteer positions or internships if they are relevant to the position you are seeking. 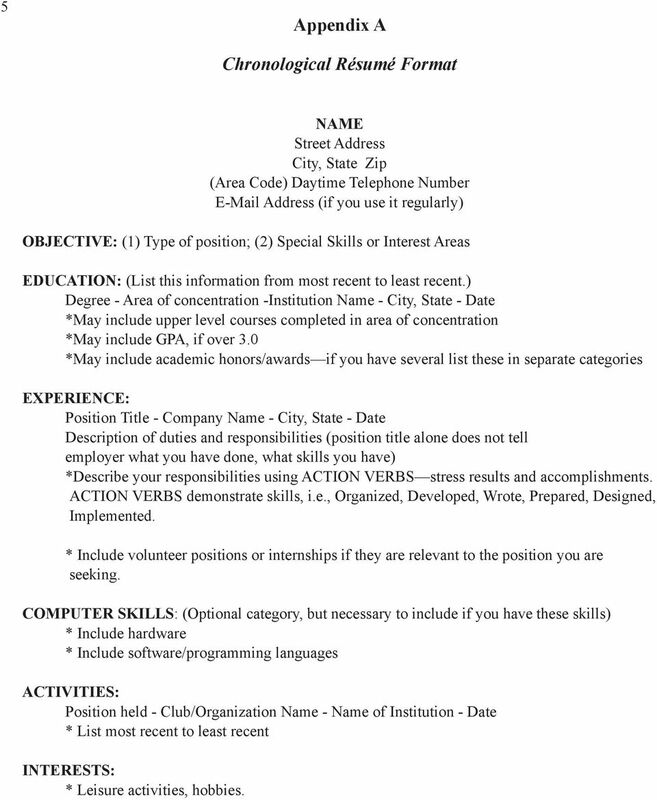 COMPUTER SKILLS: (Optional category, but necessary to include if you have these skills) * Include hardware * Include software/programming languages ACTIVITIES: Position held - Club/Organization Name - Name of Institution - Date * List most recent to least recent INTERESTS: * Leisure activities, hobbies. 7 7 APPENDIX B Combination Chronological/Functional Résumé Format NAME Street Address City, State Zip (Area Code) Daytime Telephone Number Address (if you use it regularly) OBJECTIVE: (1) Type of position; (2) Special Skills or Interest Area AREAS OF EXPERTISE *This section is the body of your résumé, as it is built around skills you have and want to use. These skills, usually 3 to 4 main headings, are reinforced by demonstrated statements from your background. The following serve as examples only there are many possible headings depending on the skills you are trying to convey. Make sure the skills that you use are relevant to the positions you seek. COMMUNICATION SKILLS (Usually 3 to 5 statements are sufficient) Advised individuals and groups about financial planning through presentations, seminars. Researched and wrote articles for company newsletter. MANAGEMENT AND ADMINISTRATIVE SKILLS Managed the day-to-day operations of a high volume office. Trained clerical staff on usage of word processing equipment. Supervised the performance of a staff of 15. MARKETING AND PUBLIC RELATIONS SKILLS Handled customer problems and complaints as training director. Maintained and updated a marketing strategy targeted toward different user/client groups. WORK EXPERIENCE Position Title - Company Name - City, State, - Date List positions from most recent to least recent. The position description your duties and responsibilities should be placed under the appropriate skill headings. EDUCATION Degree - Name of School/Institution - City, State - Date If you are currently in school or specialized training for the position you are seeking, you may want to elaborate on the course work. 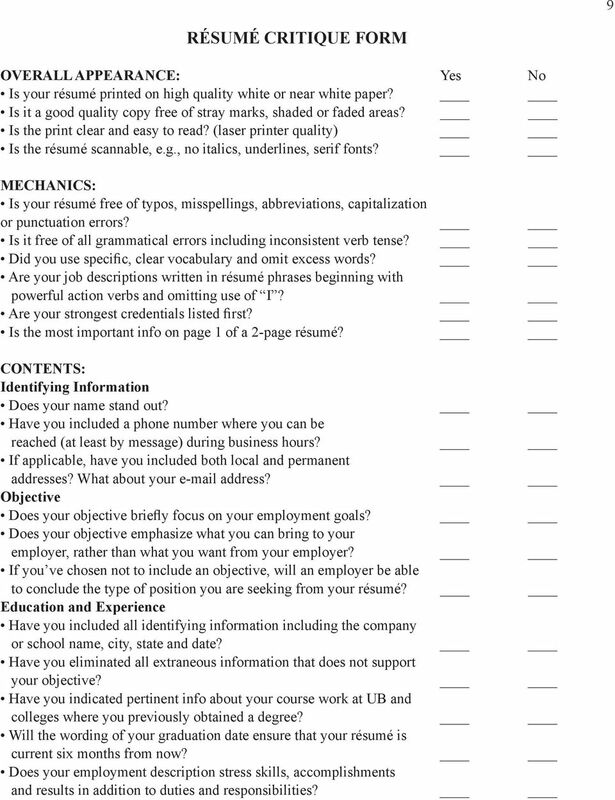 9 9 RÉSUMÉ CRITIQUE FORM OVERALL APPEARANCE: Yes No Is your résumé printed on high quality white or near white paper? Is it a good quality copy free of stray marks, shaded or faded areas? Is the print clear and easy to read? (laser printer quality) Is the résumé scannable, e.g., no italics, underlines, serif fonts? MECHANICS: Is your résumé free of typos, misspellings, abbreviations, capitalization or punctuation errors? Is it free of all grammatical errors including inconsistent verb tense? Did you use specific, clear vocabulary and omit excess words? Are your job descriptions written in résumé phrases beginning with powerful action verbs and omitting use of I? Are your strongest credentials listed first? 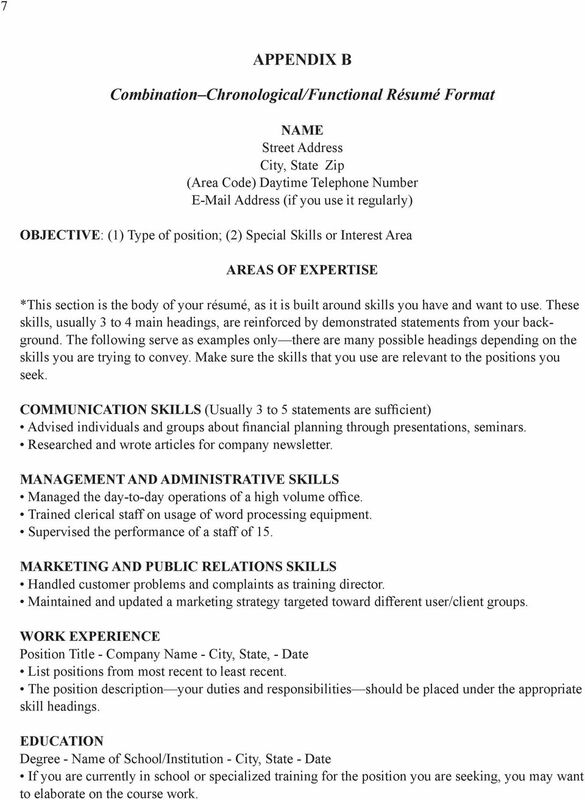 Is the most important info on page 1 of a 2-page résumé? CONTENTS: Identifying Information Does your name stand out? Have you included a phone number where you can be reached (at least by message) during business hours? If applicable, have you included both local and permanent addresses? What about your address? Objective Does your objective briefly focus on your employment goals? Does your objective emphasize what you can bring to your employer, rather than what you want from your employer? If you ve chosen not to include an objective, will an employer be able to conclude the type of position you are seeking from your résumé? Education and Experience Have you included all identifying information including the company or school name, city, state and date? Have you eliminated all extraneous information that does not support your objective? Have you indicated pertinent info about your course work at UB and colleges where you previously obtained a degree? Will the wording of your graduation date ensure that your résumé is current six months from now? Does your employment description stress skills, accomplishments and results in addition to duties and responsibilities? 2. What type of job are you seeking? It can help to have a specific objective or use the position to craft a targeted resume. INTERNATIONAL BUSINESS RESUMES for Undergraduate Business Students Creating a Results Resume A resume is a written summary that highlights your education, experience, skills, and other relevant information. RESUME GUIDE: MEDICAL BILLING AND CODING How to Prepare an Effective Resume Introduction A resume is a formal summary of your education, experiences, and skills. It should be simple, logical, and brief. Consider using a personal email on your resume rather than the Columbia University email, since the email address may expire post-graduation. Résumé Tips. Wall St. Training is a registered servicemark of HL Capital Partners, Ltd. Hamilton Lin, CFA. (212) 537-6631 hamilton@wallst-training. SUGGESTED FOLLOW-UP: Students could conduct a peer review of their draft resumes. Good resumes often borrow ideas from other resumes. 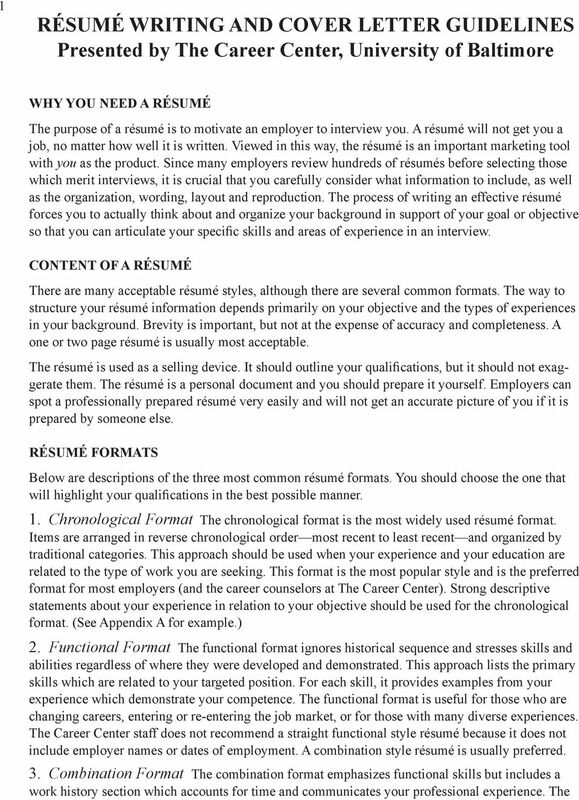 There are three different types of résumés: chronological, functional and combination. RESUME GUIDE Step-by-Step Résumé Breakdown Your résumé is a summary of your experiences in work and in school. Employers match your résumé against their job openings to evaluate if you d be a good fit. Note: Request an electronic copy by emailing psyadv@iupui.edu. It will make following the numerous links in this document much easier. 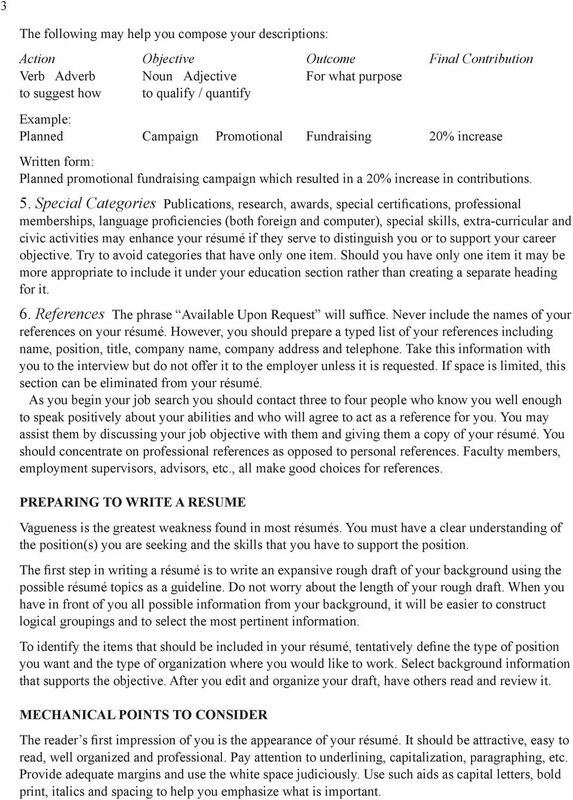 Resume and cover letter writing are part of STEP #5: Pre-Employment/Job-Hunting of the Career Development process. How to write a resume that is informative, attractive and easy to read: Please review this information thoroughly and prepare your resume draft before bringing your resume to be reviewed by a career counselor.